Shopping for a new Nissan Altima? The 2019 Nissan Altima makes the most sense closer to base. Skip the sporty version and score an SV with ProPilot Assist. With the Altima, Nissan offers the usual trim levels: S, SR, SV, SL, and Platinum grades. All-wheel drive is a $1,350 spend-up option at every stop, including base. The raucous turbo-4 costs at least $3,000 more, and is available with front-wheel drive only on SR and Platinum trims. Regardless of engine or trim level, the 2019 Altima adds sharper looks this year and a better body for its mass-appeal mid-sizer. We appreciate how the Nissan arrives: Its creased hood is unfettered now with shunt lines moved to near the fenders, and a wide-open maw may be a little much for some—but it’s never boring. Under the hood is a standard 2.5-liter inline-4 that makes 188 horsepower mated to a continuously variable transmission. Efficiency is its focus, it should return more than 30 mpg combined. All-wheel drive is only available on the base engine and it should be peace of mind for snowy-state buyers, and the unobtrusive system doesn’t dramatically impact performance or efficiency. A 248-hp turbo-4 takes over for last year’s V-6. The turbo-4 borrowed from the Infiniti QX50 crossover SUV varies its operation to maximize efficiency—or fun. It’s available only on front-drivers for now, and costs plenty. We’ll report back once we’ve had more turns behind the wheel. We appreciate the Altima’s stellar safety package. Every sedan is equipped with automatic emergency braking at least. Many Altimas will get much more. The most popular versions of the Altima also will feature blind-spot monitors, active lane control, rear automatic emergency braking, and adaptive cruise control. A suite of driver-assist features, called “ProPilot Assist,” will be available on many models and can help ease the task of daily slogs. Base Altimas get good stuff, too. An 8.0-inch touchscreen for infotainment is standard on all models and includes Apple CarPlay and Android Auto compatibility. Bluetooth connectivity, remote start, keyless ignition, and four USB charge points help the Altima pronounce its value to budget buyers. More expensive models add premium audio, leather, bigger wheels, and more safety gear. The 2019 Altima’s honed exterior is sharper and cleaner. The 2019 Nissan Altima takes the brand in a direction that we can appreciate. 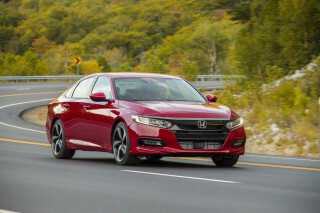 Its sharper lines and crisper sheet metal is not only better looking than the outgoing sedan, it’s also better than most of its contemporaries too. Along the sides, the Altima draws a neater profile than previous years. A character line stretches straight across the front fender to the rear taillight, but our eyes are attracted to a subtle bend that starts lower on the front wheel and meets the character line near the windows. Chromed door handles punctuate that line, and the rear door handles sit higher than the front, which seemingly drops the car onto its shoulders. Neat. Nissan’s “floating roof” seen first on the Murano and on other models is here too, just tamed a little. Inside, designers have added some flourish to the Altima’s dash—but mostly in top trims. A center touchscreen still dominates the dash, and the center tunnel is wide. Light finishes look better inside, and there are five interior color combos. Anything but black, OK? Around town, the 2019 Nissan Altima excels from stoplight to stoplight; a new turbo-4 picks up the pace. Maybe you need to get to work? Maybe you need to get to the stores? Maybe you just need a car for school? Maybe we should mind our own business. Most versions of the 2019 Nissan Altima won’t be thrilling to drive—maybe that’s the point? We rate the Altima based on front-drive, 2.5-liter inline-4 models that are most often found on dealers’ lots. Adding all-wheel drive doesn’t change much, but we’re betting opting for the turbo-4 will—we just haven’t driven those versions yet. This year, Nissan revised its base engine for more power and slightly better fuel economy. The 2.5-liter inline-4 makes 188 hp, up 9 hp from last year, and returns 32 mpg combined. It’s still paired to a CVT that get paddle-shifters on SR-equipped models. The 2.5-liter inline-4 is a little quieter, but not perceptively faster than last year’s version. Better transmission programming keeps the 2.5-liter in a less-frantic mood, although the 19-inch wheels on SR-equipped models add back some of the noise we didn’t miss from last year’s version. Riding on standard 17-inchers, the Altima is calm and collected, without much drama behind the wheel. This year, the Altima is equipped with electric-power steering—the first time for Nissan’s mid-size sedan—that steers the car comfortably and easily. The Nissan tracks confidently down the highway, with a generous on-center spot and effortless steering. Livelier runs aren’t the Altima’s forte, but a stiffer body helps control the sedan’s motions better than before. Opting for all-wheel drive, which is available on every trim level for $1,350, should give drivers confidence in wet-weather states, which is all but maybe two. 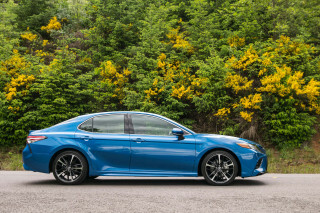 The system, which starts the car at a 50/50 torque split front-to-rear, can shift all of its power to the front wheels for better fuel economy, or up to 70 percent to the back for sportier driving. We assume that most drivers will opt for the system for better cold-weather grip on ice and hard-pack snow—rather than any performance gain—and it’s almost a wash behind the wheel. Only a slight weight difference is noticeable, and only if you drive the front-driver back-to-back with all-wheel-drive versions. The big news for a small number of buyers this year is a 2.0-liter turbo-4 that makes 248 hp and 280 lb-ft lifted from the Infiniti QX50 that replaces the outgoing V-6. The variable compression engine can change the way it operates for better fuel economy, or power, depending on situation. It’s a spendy option; the turbo-4 adds $4,050 to the cost of an Altima SR, or $3,000 to Platinum-equipped versions. The turbo-4 is only available with front-wheel drive. We didn’t get a chance to drive those versions yet, but Nissan expects that a small number of buyers will opt for that engine—fewer than one in five. Opting for the SR trim level adds a few more sporty touches than years past. Uprated rear shocks and a stiffer steering wheel await buyers looking for a sportier Altima, but we think the 19-inch wheels are just too much unnecessary noise. Spacious and comfortable, the 2019 Nissan Altima easily accommodates four adults or more. The 2019 Nissan Altima is more comfortable this year thanks to more space between the wheels and a better rear seat. This year, the Altima rides atop a 111.2-inch wheelbase that’s stretched by a couple inches over last year’s model, but the overall length is roughly the same. Up front, Nissan’s ergonomically designed seats are comfortable for long hauls and supportive for most body types. Only the broadest shoulders will search for more support, and thick torsos will need just a little more side bolstering. Nissan lowered the cowl in the Altima for better outward vision, and largely succeeded. Even though the Altima sits relatively lower to the ground, the road ahead is easy to spot and even with a long nose, it’s not hard to place the car into parking spots. Our gripe: Some of the dash materials on top of the instrument cluster reflect onto the windshield. Our drives in sunny Southern California gave us a front-row view of the backside of the binnacle. Sitting taller in the driver’s seat alleviates some of the glare, but we hope Nissan goes further with materials that are less reflective. The new Altima’s rear seat is better than last year’s, due to a lower position in the car. 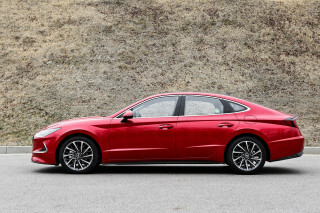 Although the 2019 Altima is down on leg room compared to last year’s model on paper, 6-footers won’t have problems sitting behind other 6-footers. The rear seats are comfortable, although its lower position in the car makes entry and exit more challenging and the seating position feels more knees-up compared to other makes. This year, the Altima gets a 15.4-cubic-foot trunk—same as last year—but the opening is wider and the load floor is lower for easier stowing. Throughout the cabin, Nissan has draped the Altima in soft-touch material—most of it above the belt line. There are still hard black plastics below the beltline and in hard-to-reach areas, such as the rear passenger door sills and behind the instrument cluster. Nissan upgraded its palette of interior materials to include brighter shades for an airer cabin. It’s an upgrade on last year’s Altima, but perhaps not as impressive as the interior of the Honda Accord. 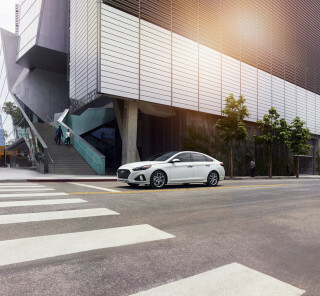 The 2019 Nissan Altima puts safety into the standard column. 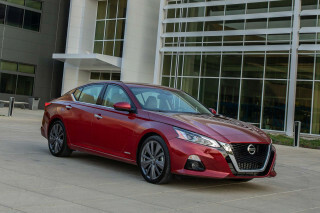 The IIHS says the 2019 Altima earns "Good" scores in all its major crash tests. On headlights, the agency dings it slightly, with an "Acceptable" rating, which means the new Altima earns a Top Safety Pick nod. The NHTSA hasn't reported yet, but its ratings could lift the Altima a point here. Aside from crash-test scores, the 2019 Nissan Altima is equipped with impressive safety technology that many other mainstream mid-size sedans don’t yet offer. Every Altima that leaves the factory will be equipped with forward collision warnings with automatic emergency braking. Most Altimas on dealers’ lots (SV and higher) will go further. A bundle of active safety features that include automatic emergency braking with pedestrian detection, blind-spot monitors, active lane control, adaptive cruise control, and rear automatic emergency braking are standard equipment too. On SV trims and higher, Nissan makes standard its driver-assistance features called “ProPilot Assist” that can keep the Altima centered in its lane and follow a car ahead. It’s far from a hands-off system—the Nissan loves to beep after a lane change, or if it hasn’t detected effort on the steering wheel for 10 seconds or so—but it’s a useful feature that can reduce driver fatigue on long drives. 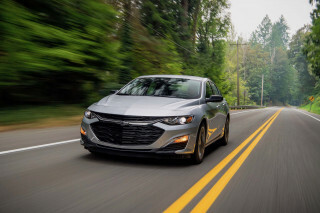 Active safety features complement a set of standard safety equipment that we’d expect: airbags for all belted passengers, stability and traction control systems, good outward vision, and a rearview camera. A surround-view camera system is available on top trim Platinum models. There’s good value in the middle of the 2019 Altima lineup—even more in the base version, too. Nissan knows how to woo shoppers into a showroom. The 2019 Altima is offered in S, SR, SV, SL, and Platinum trim levels, with increasing features that will challenge its rivals. One thing Nissan does better than some of those rivals: its base cars get most of the good stuff, already. The base 2019 Altima S is hardly luxurious, but it is well-equipped. It offers cloth upholstery, Bluetooth connectivity, an 8.0-inch touchscreen with Apple CarPlay and Android Auto compatibility, automatic emergency braking, remote start, keyless ignition, and four USB charge ports, for $24,645. The only demerit? 16-inch wheels with caps. All-wheel drive is available on every trim level, including base for $1,350 more. The Altima’s bottom line can swell past $35,000 with a top-of-the-line Platinum equipped with a more powerful 2.0-liter turbo-4. For that spend, Nissan offers leather upholstery, a leather-wrapped heated steering wheel, 19-inch wheels, power-adjustable heated front seats, navigation, premium audio by Bose, a surround-view camera system, driver-assist features (that we cover above), active safety features, and a moonroof. We see better value in the Goldilocks zone, right around the SV trim level. 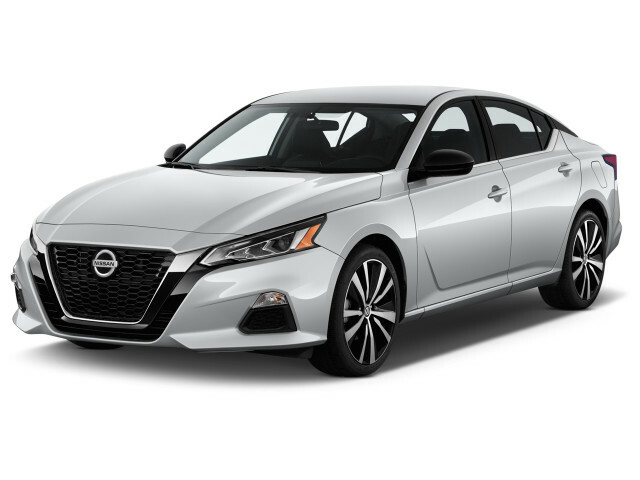 For $28,825, the 2019 Altima SV offers cloth seats, 17-inch wheels, heated front seats, a leather-wrapped heated steering wheel, remote start with climate conditioning, dual-zone climate controls, and active safety features including Nissan’s suite of driver assistance systems. That last part is perhaps the most important: few cars on the road offer the same driver-assistance systems, and those that do can easily cost twice as much as the Altima. We wouldn’t begrudge anyone for considering the SL trim level that, for roughly $2,000 more, adds leather upholstery and premium audio to the Altima SV. Fuel efficiency has always been a calling card for the Nissan Altima. Fuel economy for the 2019 Altima is strong, though no hybrid Altima can rival a gas-electric Toyota Camry. The EPA rates the base 2019 Altima at 28 mpg city, 39 highway, 32 combined. Altima SR models wear bigger wheels that knock fuel economy down slightly: 27/37/31 mpg. The new variable-compression turbo-4 found in the Altima is more efficient than the V-6 it replaced. Those models, which are front-wheel drive only, rate 25/34/29 mpg. The outgoing V-6 was rated up to 26 mpg combined.